from Turk v Somervell County Hospital District and Ray Reynolds. p 55 of Ray Reynold's deposition. Background: Liz Morgan, who was Director in charge of patient records and whose daughter took a photo of a body bag from GRMC hospital window, pled guilty to a 3rd degree felony for embezzling money from a church. Leter she violated her probation by driving drunk and was shortly thereafter terminated from GRMC. May 2015- Liz Morgan pled guilty to 3rd degree felony. 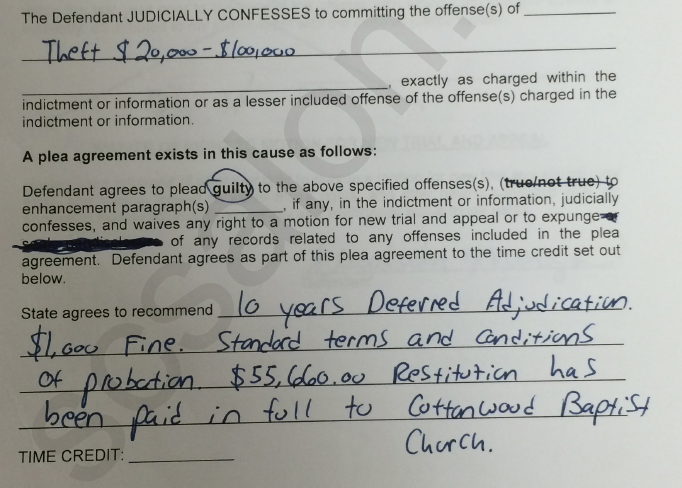 She went on deferred adjudication with probation terms for 10 years. January 2016- FINALLY suspended indefinitely. Now, what did Ray Reynolds say in his deposition in the court case about Morgan? When you read this, consider the time line and ask youself why it is that Ray Reynolds or, for that matter, Somervell County Hospital District board, left a woman in place who had pled guilty to embezzling over $55,000 from a CHURCH, to continue to be over patient's medical records at a Director level!!!!! That's NINE MONTHS LATER than she went to court before she got a DUI. NINE MONTHS. What does it say about Reynolds as CEO that he left someone of this low calibre in charge of patient records for that long? Ray Reynolds can hardly say that he was unaware of her conviction. I have no idea what was said in this executive session but when it ended Paul Harper made a motion to terminate Liz Morgan, which for some bizarre reason he couldn't get a second for. Seems pretty negligent to me. A. The embezzlement, she was accused, she denied, and had been charged but had not been convicted. So based on that, since she didn't handle money in her responsibilities as the HIM director, I determined to let her continue to be employed until a decision was made on the embezzlement. Q. And then something else happened? A. She was arrested for a DUI. Q. And what did you do next after she was arrested? A. I terminated her as a result of that. Q. Was she convicted at the time you terminated her? Q. Did she confess to you that she's been DUI? A. Yes. She didn't deny that she was stopped and arrested for a DUI..... She told me that she had been arrested for a DUI. Let me just say that- say it that way. Q. Did she comment one way or the other to you about whether she was DUI before you terminated her? .. Q. And as to the previous charge of embezzlement from her church, you decided to leave her in place with management responsbility for medical records, is that correct? A. I decided to leave her in her current position since she did not handle any money whatsover. Q. She was in charge of medical records when you left her in place. Is that fair?